There are many pressures on everyone in the workforce. The desire to get ahead can push anyone to consider cutting a few ethical corners. You cannot truly measure yourself only by what you have achieved. More important is what you as a person have become in the process. 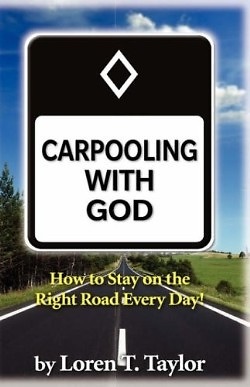 Carpooling With God is a simple story written about a character named Jim Fletcher who inadvertently invites God to come to work with him. Jim is dissatisfied with his life and God appears as a special friend who helps him to point his life in the right direction. The book is divided into ten chapters, each one representing a step in the process and become the elements of a special prayer that readers are encouraged to take with them and read often as a reminder. Carpool with God each and every day and there is nothing that can stop you. Loren Taylor is President of his own consulting and invention business, Taylored Concepts, LLC., working closely with major companies in the U. S. and around the world. He has over 30 years of experience, largely as an executive in major corporations. He has worked for six companies in four industries, ranging in size from start-up to well over two billion dollars. Taylor experienced a strong Christian upbringing and remains a very active member of the United Methodist Church. Taylor has augmented his active involvement with his religion by attending many different types of religious services and by extensive and exhaustive study. Taylor was born in New Jersey, graduated from Albright College with an A. B. Degree and from Rutgers University with an M. B. A. in Marketing. He is married with two children and lives in New Jersey and is a very active Boy Scout leader.